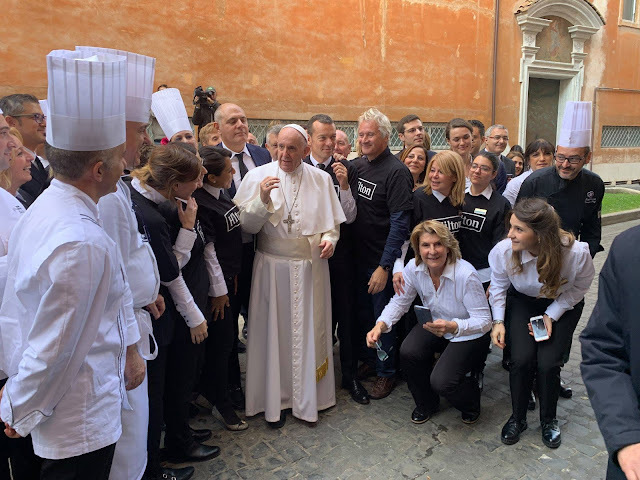 As a part of the World Day of the Poor, Pope Francis on Sunday joined about 1,500 poor people and a group of volunteers for lunch. After celebrating a special Holy Mass in St. Peter’s Basilica, encouraging helping the poor, Pope Francis recited the Angelus prayer. He then went to the Paul VI Hall and sat amongst the poor gathered for lunch. Pope Francis gave thanks for those who prepared the lunch and for those who were serving and asked for the Lord’s blessing for all those present. According to Vatican News, a youth band from the Shrine of Our Lady of Pompei provided musical selections. The menu included lasagna, chicken morsels, mashed potatoes and tiramisu.